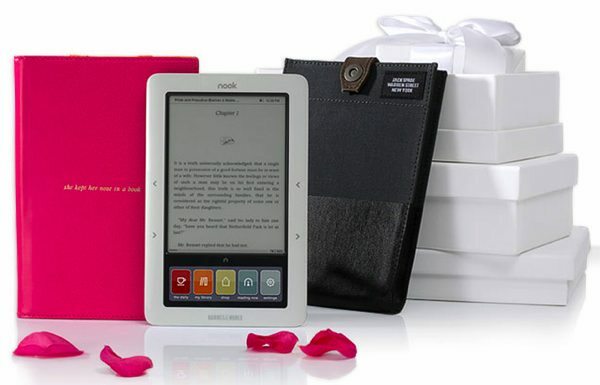 Now bookworms can take their literary love affair to the next level with the in-stock and in-store Barnes & Noble Nook e-reader. The continually “out-of-stock item” has finally arrived in abundance at the bookselling giant. Now you can get yourself or your sweetheart a Nook before February 14th. Barnes & Noble says that starting this February, Nook users and hopefuls can browse the extensive library of more than a million eBooks, magazines and newspapers and enjoy exclusive “More In Store” content and promotional offers, which include: A short story by bestselling favorite Adriana Trigiani, A Valentine’s Day recipe for red velvet cupcakes from Anne Byrn, the Cake Mix Doctor, and “Read Between the Wines,” a regular feature by renowned wine expert Kevin Zraly. You can visit the Barnes & Noble Nook In-Store Locator at www.bn.com/nook/instore, which is updated daily beginning February 10, to find local stores with devices in-stock.